Heating and air conditioning system (HVAC) is not working right? We can help! Our expert technicians provide the best quality service in the area. Whatever your needs are, we can keep your HVAC running for years to come. When your HVAC quits, call us for a FREE estimate! Conventional wisdom says that any major piece of machinery or equipment, such as an electric or gas furnace, requires regular maintenance in order to function properly and to realize its expected useful life. However, especially in the case of gas furnaces, we don’t usually hear why regular maintenance is important. Because of this, many people may assume that it’s just a way for furnace service companies to make more money. This couldn’t be further from the truth! An unmaintained furnace likely leads to more high-cost repairs, and eventually the premature replacement of the furnace. Wheel A dirty blower wheel can cause several problems. It reduces air flow generated by the wheel, meaning the blower motor has to work harder and can fail as a result. Reduced air flow can also decrease the comfort of the home, and cause the furnace’s heat exchangers to overheat and fail. Also, because the blower motor has to work harder, it will use more electricity, reducing the efficiency of your heating system. A dirty blower can also be unbalanced, putting further strain on the blower motor, further increasing the likelihood of failure. 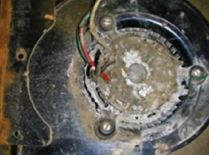 When we see a blower motor failure, chances are that the blower motor and/or the blower wheel are dirty. Here in SE Idaho, we see this problem quite frequently on unmaintained furnaces. As the blower motor gets increasingly dirty, it is unable to properly cool itself and has to work harder to turn. This puts a lot of strain on the motor and eventually leads to failure. A blower motor replacement typically is a minimum of $500.00, making this an expensive lesson to learn! As part of a regular maintenance, a gas furnace technician will check your furnace for CO gas levels. Carbon monoxide gas (CO), also called the ‘silent killer’, is tasteless and odorless and can be harmful or fatal at high levels. 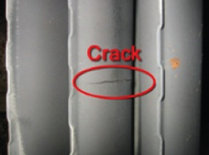 Heat exchangers in gas furnaces can develop cracks over time, through which CO gas is released. By having regular maintenance performed on your gas furnace, you will ensure that your home and its inhabitants are safe from these harmful exhaust gases. 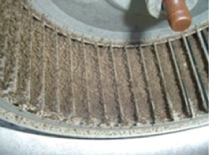 A clogged filter can cause a lot of problems for a furnace, reducing its efficiency and lifespan. When a filter becomes clogged, airflow through the filter is reduced. This causes the furnace blower to have to work harder, meaning it will use more electricity and be more likely to fail. Reduced air flow will also cause problems with comfort and air quality in your home. As your filter becomes clogged and less air is allowed to flow through it, its ability to remove particles from the air is reduced, meaning the air in your home will contain more unfiltered contaminants. 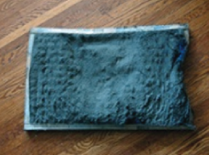 We recommend changing your furnace filter every three months, or at absolute minimum twice a year. If you have a lot of pet dander, dust, or other contaminants in the air in your home, you may consider changing the filter more often. Most gas furnace manufacturers’ warranties require regular maintenance. If your gas furnace fails due to prolonged negligence, it could void your warranty, piling onto an already unfortunate situation.